Another dish that I’ve been asked to make healthier is this healthy Tuscan Chicken Pasta! 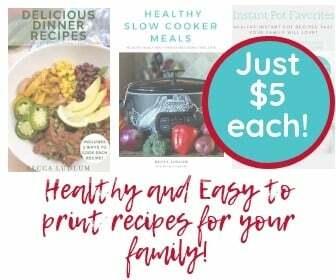 It’s so easy to cook on the stovetop, in the Instant Pot or even in the Slow Cooker, and I can almost promise that your entire family will love it! Tuscan chicken is a the king of one pan meals! It usually combines onions, garlic, sun dried tomatoes, fire roasted tomatoes, beans, and spices which chicken and pasta. Tuscan Chicken Pasta simmers together and the flavors all meld together so beautifully. It’s a classic comfort food that has an Italian flavor. SO many people rave about the Tuscan Chicken from the Cheesecake Factory, so I thought I had to try and make a healthier version of it. Is there a lot of garlic in Tuscan Chicken? This particular recipe has some garlic in it. I don’t think that it’s overpowering but you can certainly adjust the garlic to your tastes and preferences. Making Tuscan chicken doesn’t have to mean an overwhelming garlic experience. Just adjust the amount you want, and you can always add more later if it doesn’t seem like enough! How many calories are in Tuscan Chicken? You can see all of the nutritional information for this recipe below near the recipe. There are also 21 Day Fix container counts and suggestions for enjoying this meal while on 2B Mindset. 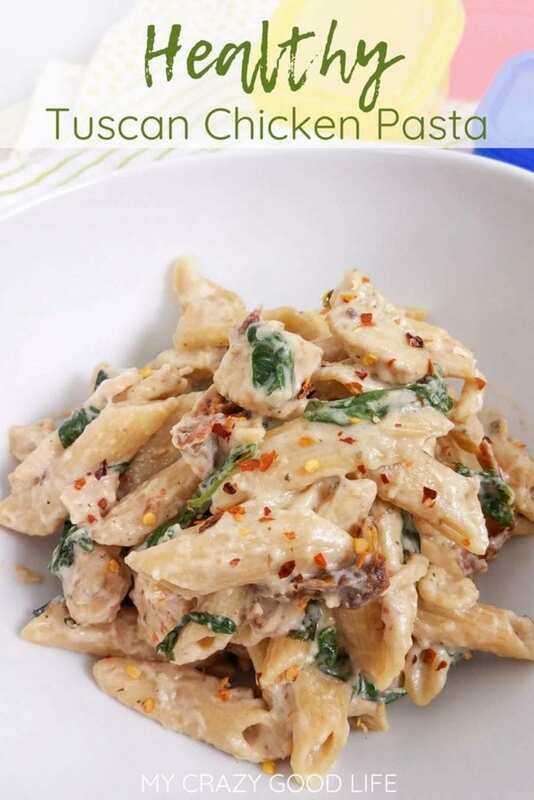 If you’re looking for a Weight Watchers version of this Tuscan Chicken Pasta, I have one! 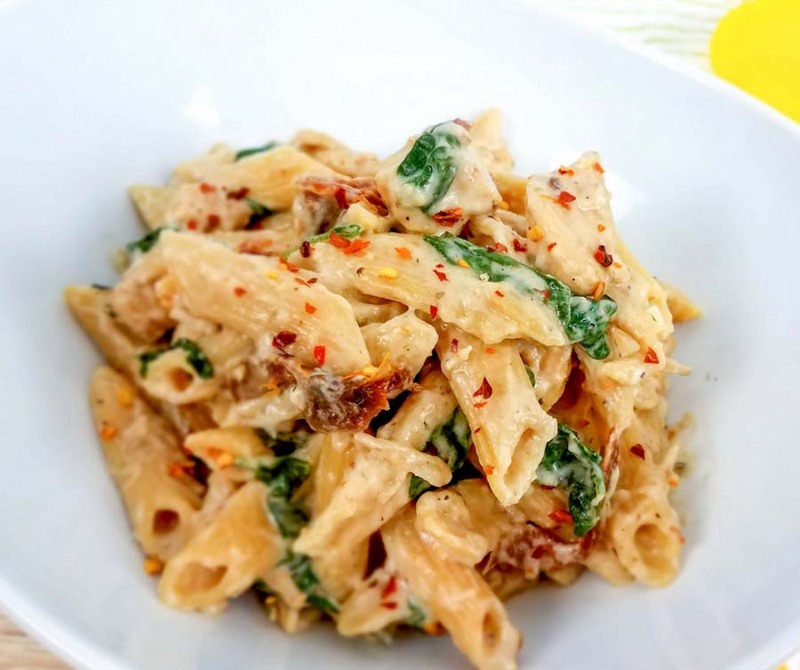 I’ve changed up the ingredients a little bit and calculated the freestyle points for this Weight Watchers Tuscan Chicken Pasta. How to cook Tuscan Chicken–3 ways! 1) Turn the Instant Pot to sauté mode and spray with oil once it heats up. Add the sun-dried tomatoes, garlic, Italian seasoning, salt, and pepper. Sauté for 30 seconds until fragrant. 2) Next, add the chicken to the Instant Pot. Brown the chicken for 1-2 minutes, this will keep the chicken from sticking together while cooking. 3) Add the pasta and chicken broth to the Instant Pot, if needed stir the pasta to make sure all the pasta is covered by the liquid. 4) Close the lid and turn the pressure valve to sealing. Cook on high pressure using the manual setting for 4 minutes. Quick releasing the pressure is preferred, but know that sometimes pasta can spray out and make a mess so watch for that. 5) While the pasta is cooking blend together the cottage cheese and Greek yogurt to make a cream sauce. Set it aside until ready to use. 6) Remove the Instant Pot lid and stir the noodles and pasta. While the pasta is still hot add the parmesan cheese, spinach, and basil. Mix the pasta until the cheese melts and the spinach wilts. 7) Pour the blended cream sauce over the pasta. Stir it until all the pasta is covered in sauce. Serve immediately. 1) In a large skillet sauté the sun-dried tomatoes, garlic, Italian seasoning, salt, and pepper on high heat for about 30 seconds until fragrant. 2) Add the chicken to the skillet, brown the chicken for 1-2 minutes. This will keep the chicken from sticking together while cooking. 3) Transfer the chicken and sundried tomatoes to your slow cooker insert. Add the chicken broth and stir. 4) Place the lid on the slow cooker. Cook on high heat for 2-3 hours or low heat for 4-5 hours. Add the pasta for the last 30 minutes. 5) Remove the lid and stir in the parmesan cheese, spinach, and basil. Let the cheese melt and the spinach wilt. 6) Blend together the cottage cheese and Greek yogurt to make a cream sauce. Pour the cream sauce over the pasta and stir it until the pasta is completely covered in sauce. Serve immediately. Note: if you are using dried basil instead of fresh add your basil when you sauté the sun-dried tomatoes instead of the end. 3) Pour the pasta and chicken broth in the skillet. Give it a quick stir to make sure all the pasta is covered by the liquid. Bring the broth a boil then reduce the temperature to medium heat. 4) Cover the pan and cook for 12-15 minutes, stirring occasionally, until the pasta is done. 5) While the pasta is still hot add the parmesan cheese, spinach, and basil. Mix the pasta until the cheese melts and the spinach wilts. 6) Blend together the cottage cheese and Greek yogurt to make a cream sauce. Pour the cream sauce over the pasta. Mix until all the pasta is covered in sauce. Serve immediately. What should I serve with Tuscan Chicken? I’d definitely serve some extra vegetables with this dish! I love spinach (yes, just like the spinach in the dish! ), broccoli, or even Brussels sprouts. I highly recommend baked carrot fries and turnip fries, as well–they’re a fun side dish that you can eat with your fingers! I also love adding raw veggies, and often cut a plate of raw veggies for our dinner table. They’re always gone at the end of the meal–it’s an easy way to get some extra veggies in! 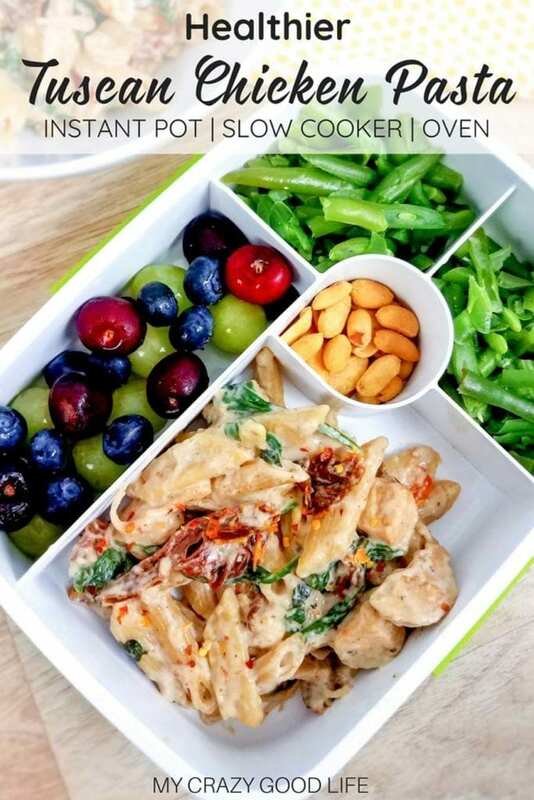 One serving of this healthy Tuscan chicken would be ideal for lunch after reducing the pasta in the recipe (see below). It’s a little extra protein than needed for your 50/25/25. Is this Tuscan Chicken good for meal prep? Like I said, I swear this meal gets better the day after you cook it! I love portioning it out in my meal prep containers for the week and adding extra veggies in. I’ve often added spinach to this recipe–like, a LOT of spinach–and it’s delicious! 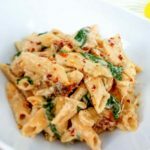 Can I reduce the carbs in this Healthy Tuscan Chicken Pasta recipe? You can! If you’d like to reduce the yellows/carbs, cook 6 ounces of pasta instead of 12 ounces. For the 12 ounces, I “measure” by using a 12 oz box of pasta. When using only half of the pasta, I measure out the pasta and divide it in half. In the Instant Pot, you can reduce the broth to 1 1/2 cup and cook 6 ounces of pasta–this will change your 21 Day Fix container count to 6 Y for the entire recipe, 1 Y per serving. It’s definitely not a low carb meal, but this small change will make it lower in carbs. Turn the Instant Pot to sauté mode. Add the sun-dried tomatoes, garlic, Italian seasoning, salt, and pepper. Sauté for 30 seconds until fragrant. Next add the chicken to the Instant Pot. Brown the chicken for 1-2 minutes, this will keep the chicken from sticking together while cooking. Add the pasta and chicken broth to the Instant Pot, if needed stir the pasta to make sure all the pasta is covered by the liquid. Close the lid and turn the pressure valve to sealing. Cook on high pressure using the manual setting for 4 minutes. Quick releasing the pressure is preferred, but know that sometimes pasta can spray out and make a mess so watch for that. While the pasta is cooking blend together the cottage cheese and Greek yogurt to make a cream sauce. Set it aside until ready to use. Remove the Instant Pot lid and stir the noodles and pasta. While the pasta is still hot add the parmesan cheese, spinach, and basil. Mix the pasta until the cheese melts and the spinach wilts. Pour the blended cream sauce over the pasta. Stir it until all the pasta is covered in sauce. Serve immediately. In an oil sprayed large skillet sauté the sun-dried tomatoes, garlic, Italian seasoning, salt, and pepper on high heat for about 30 seconds until fragrant. Add the chicken to the skillet, brown the chicken for 1-2 minutes. This will keep the chicken from sticking together while cooking. Pour the pasta and chicken broth in the skillet. Give it a quick stir to make sure all the pasta is covered by the liquid. Bring the broth a boil then reduce the temperature to medium heat. Cover the pan and cook for 12-15 minutes, stirring occasionally, until the pasta is done. While the pasta is still hot add the parmesan cheese, spinach, and basil. Mix the pasta until the cheese melts and the spinach wilts. Blend together the cottage cheese and Greek yogurt to make a cream sauce. Pour the cream sauce over the pasta. Mix until all the pasta is covered in sauce. Serve immediately. In a large oil sprayed skillet saute the sun-dried tomatoes, garlic, Italian seasoning, salt, and pepper on high heat for about 30 seconds until fragrant. Transfer the chicken and sundried tomatoes to your slow cooker insert. Add the chicken broth. Place the lid on the slow cooker. Cook on high heat for 2-3 hour and low heat for 4-5 hours. For last 30 minutes, stir in the pasta to make sure it is all under the broth. Remove the lid and stir in the parmesan cheese, spinach, and basil. Let the cheese melt and the spinach wilt. Blend together the cottage cheese and Greek yogurt to make a cream sauce. Pour the cream sauce over the pasta and stir it until the pasta is completely covered in sauce. Serve immediately. Previous Post: « Air Fryer Cooking Times + Printable Cheat Sheets! The electricity went out just when pressure started at 4 minutes. I separated the noodles to try to later. Needless to say, the noodles were a little mushy on the second try. It still had good flavor & husband approval. I diffinitely will make this again. This was so yummy and so easy!! I may use a little less chicken broth next time since it was pretty wet after it cooked. Wasn’t sure if I should drain it before adding the white sauce but I didn’t. May do that next time. Very healthy option and very filling! Made this for my meal prep. Thank you!! This recipe sounds amazing. How could we make this without pasta? Would love to substitute zoodles for the pasta. Hi Lauren! I haven’t made it without pasta, but I can help you figure out how if you tell me how you’d like to cook it! I’m not Lauren, but I wanna try this recipe with zoodles via instant pot! Have you frozen this and reheated? Does it freeze well? I made it and love it but I won’t be able to eat it all and didn’t want to throw it out. Made this in the instant pot. So easy and delicious. Great macros! Always looking for healthy options for my instant pot and this definitely is a winner! Loved it and found it hard to stick to one serving. Because my noodles weren’t “covered” I added more broth so it was a little soupy but honestly it just had more of an “Alfredo” feel. Definitely added to the rotation. Thanks so much! Thanks, Laurie! I have all my favorites at amazon.com/shop/beccaludlum under meal prep! If I don’t have cottage cheese do you have an alternative suggestion? What a tasty and easy to make awesome chicken pasta. Great flavours.